The Launch of the Lifeboat Project - a fascinating insight into the magnificent achievement of the Rotary Club of Westminster West which raised funds for the Lifeboat named "ROTARY SERVICE" - RNLI Official Number (ON) 1031 and Operational Number 50-001. The Rotary Club of Westminster West (RCWW) had a tradition of inviting its members to speak about their professions - commonly referred to as the "My Job" talks. 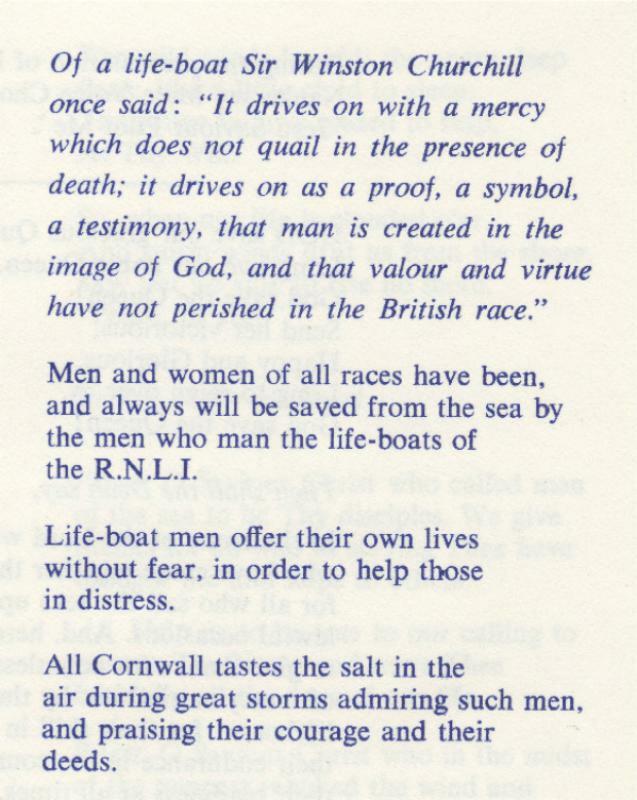 During the Rotary Year 1967-68, when PP Frank Banfield was the Club's President, members relished one particular talk by Rotarian John Atterton who was then the Deputy Director of the Royal National Lifeboat Institution (RNLI). This talk inspired the members to engage in an ongoing dialogue with the RNLI and other interested parties to set up a Fund in support of a Rotary Lifeboat. The idea gained momentum and evoked a great deal of enthusiasm as discussions rolled into the next Presidential Year of PP Nicola Garibaldi. 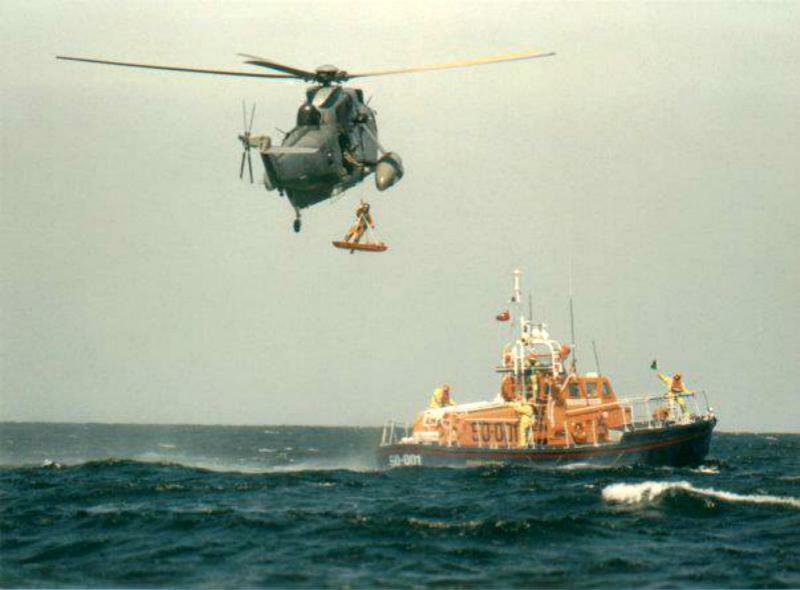 A great deal of enthusiasm was generated as there was an impending need to replace a number of life-boats which were shortly to reach the end of their service life. It all began when the RCWW arranged a meeting with both the President of RIBI, Geoffrey Sargeant, and Admiral Sir Wilfred Woods, who was the Chairman of RNLI. This meeting took place on 5th March 1968. The President advised that RIBI itself could not launch a national appeal but he saw no reason why the RCWW could not proceed on its own. 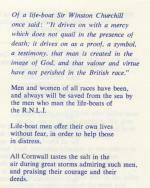 It was agreed that the RNLI would decide on the "Class" of Lifeboat and develop the specifications for it. The RCWW would set up a Lifeboat Appeal Committee (LAC) to explore the possibilities of raising the funds, which at that point in time appeared to be a very daunting task. The LAC was Chaired by PP Herbert Statham. Three Trustees were appointed - PP Herbert Statham, PP Frank Banfield and PP John Inglis. Rotarian Roy Lewis of Westminster Pimlico RC was appointed as the Treasurer. A City Accountant who was not a Rotarian joined the LAC as the Auditor. Rotarian John Atterton was appointed to advise on RNLI matters and the Officers of the RCWW served as ex-officio. (c) Any personal contacts with other organisations could be used. (e) expenses resulting from the appeal should not be charged to the Lifeboat Fund. In October 1968, a letter from the Club's President appeared in Rotary's Magazine. The response was encouraging. A "Trust Deed" of limited life was prepared and registered by a Rotarian Solicitor and the RCWW set about various fund raising promotions in the Club area. As a result of the correspondence in "Rotary", a letter was received from the Tamworth Rotary Club (TRC) stating that they had been considering a fund for a lifeboat for sometime and been working on it locally. It seemed sensible to have one appeal and the TRC joined the RCWW and the appeal was made in the joint names of Westminster West and Tamworth. Rotarian George Fathers from the TRC joined the LAC and proved to be a tower of strength. He later became Governor of District 106 and continued his active support until his untimely death in 1981. The original Trust Deed and the original appeal expired in 1972. Westminster West had started the ball rolling and more Rotary Clubs began engaging the RCWW in support of the RNLI. The Lifeboat "Rotary Service" was built by Brooke Marine in Lowestoft in 1973 and delivered to the Falmouth Lifeboat Station for testing. Its appearance generated great interest and more impetus toward raising funds to meet its then estimated cost of £200,000. The RCWW and the TRC launched a fresh appeal on the basis that Rotary should make a fairer contribution to the cost of the lifeboat. This resulted in £63,685 being raised by the end of 1981. With the assistance of many individual Rotarians and many Rotary Clubs, the total sum eventually raised was close to £155,427 and this included an enlarged RIBI contribution of £84,481.82, some legacies (of Mr D I Craig, Mary Ann Redgate and Mary Conbronge Fowkes) and £1000 bestowed by the then Late PP Herbert Statham. In addition, a legacy of £5000 from a Rotarian in Bournemouth, £10,000 from the Dover RC, further donations from the TRC and a further contribution from RIBI pushed the amount raised towards the target of £200,000. 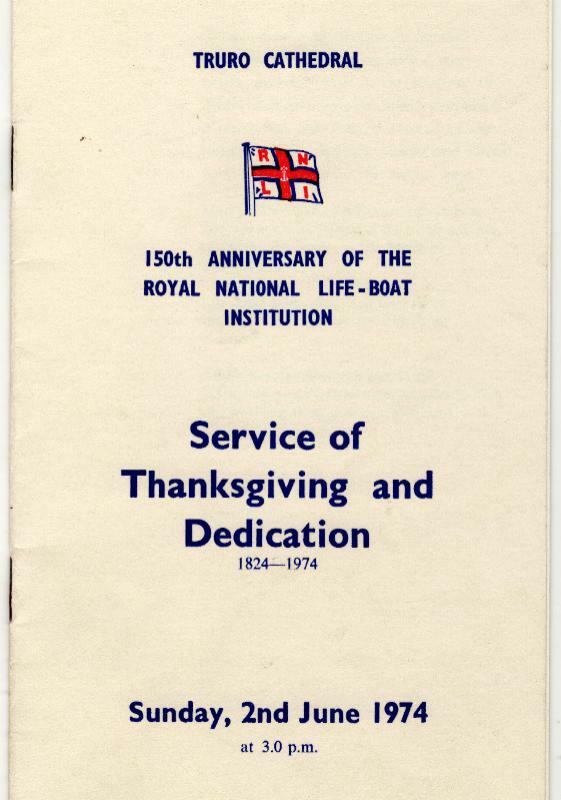 The first presentation to the RNLI of £18,500 was made at an evening meeting of the RCWW at the Royal Overseas League in 1972 and this event was attended by the Lord Mayor and Lady Mayoress of Westminster together with a strongly supportive contingent from the TRC. From the time of that first presentation to some ten years later when the full cost of the Rotary Lifeboat was realized, many thousands of appeal letters were sent out and several hundreds of hours of voluntary service were devoted to this cause. This project brought immense pride to all Rotarians at that time. "Rotary Service" - the Rotary Lifeboat. "Rotary Service" was a prototype Thames Class lifeboat operated by the RNLI. 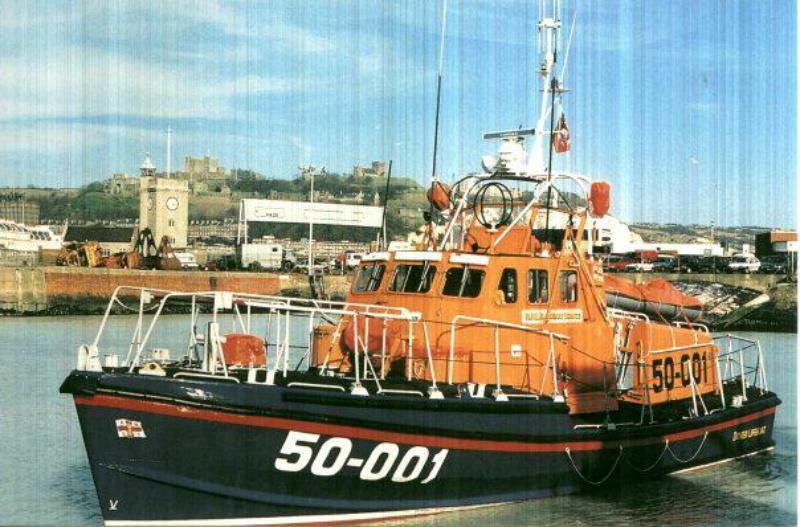 She was given the RNLI Official Number (ON) 1031 and Operational Number 50-001. The class takes its name from the River Thames which flows through London and into the North Sea. "Rotary Service" started trials at Falmouth in 1974. As she was a prototype, she was under evaluation and had enhancements made. The Thames Class lifeboat was inherently self-righting by means of a watertight super-structure. 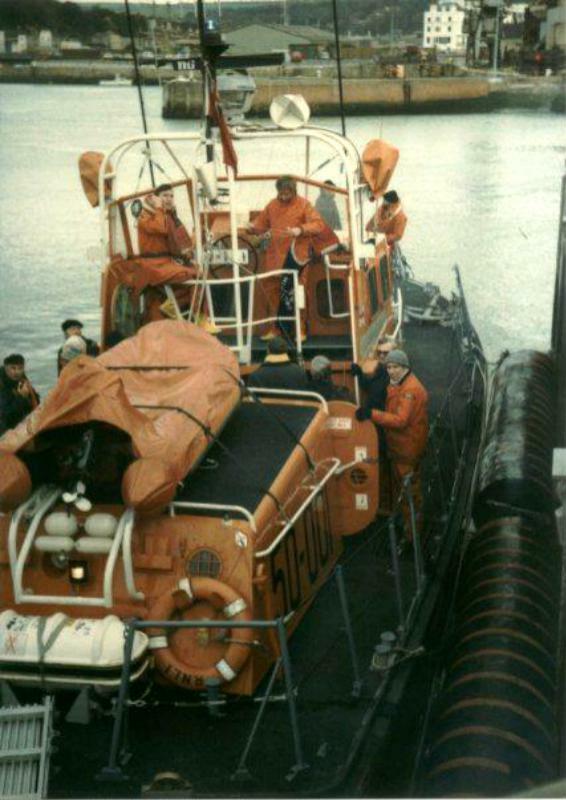 The fifty one foot Thames was one of two designs for a fast lifeboat produced in the early 1970s (the Arun Class was the other). A second Thames Class lifeboat, RNLI Official Number 1032 - Operational Number 50-002, was built and named "Helmut Schroder of Dunlossit". It too was being evaluated. During trials the original bow on both boats proved unsuitable. So a new temporary GRP bow was built for ON1032 and tested and when found suitable. Following these tests, new steel bows were built for both boats which then entered service. A further 4 Thames Class lifeboats were ordered. During her time at Falmouth, "Rotary Service" was used for 45 service calls and saved 17 lives. 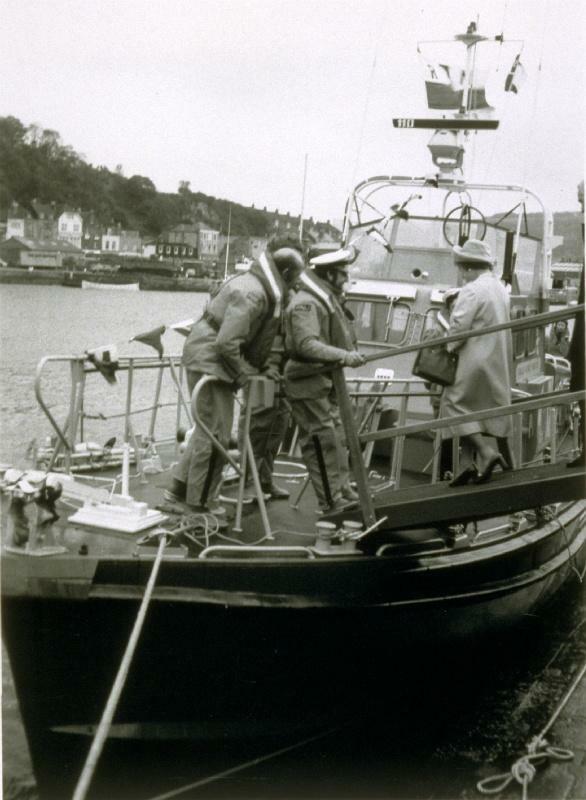 Its most meritorious service during this time was on 28 November 1977 when Coxswain Arthur West was awarded an RNLI Bronze Medal for his outstanding seamanship and tremendous courage in saving six men from a storm-lashed barge which was 110 feet by 70 feet. She was the Falmouth Lifeboat station's last displacement hulled lifeboat. She was reallocated and placed on station at the Dover Lifeboat Station in 1978. She was stationed at the best known and busiest lifeboat station and carried the name of Rotary with pride and distinction. 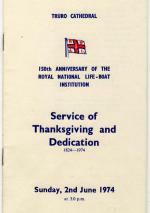 An illustration of "Rotary Service" appeared on the RNLI Official Series Cover in celebration of the lifeboat at the 10th Southampton Both Show in 1978. 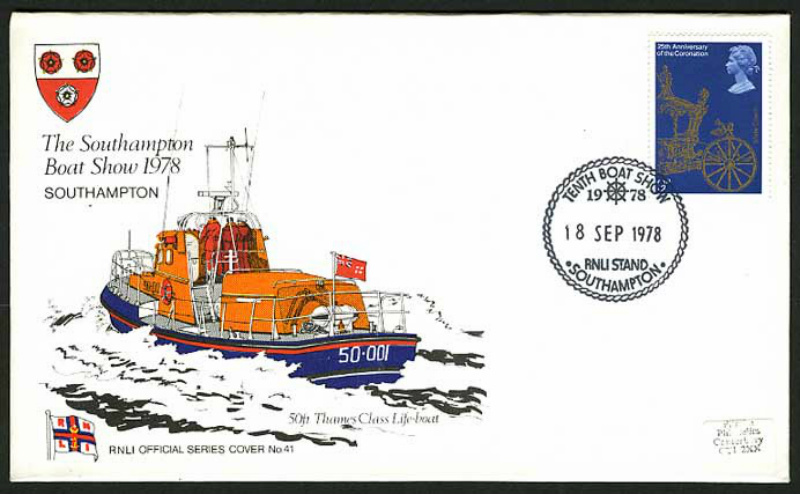 Commemorating the Tenth Southampton Boat Show in 1978, the 50ft Thames Class Lifeboat, 50-001 - illustrated RNLI Official Series Cover No.41 with stamp of 25th Anniversary of Coronation State Coach 9p SG1059. Her Naming Ceremony was carried out by the Queen Mother in October 1979. 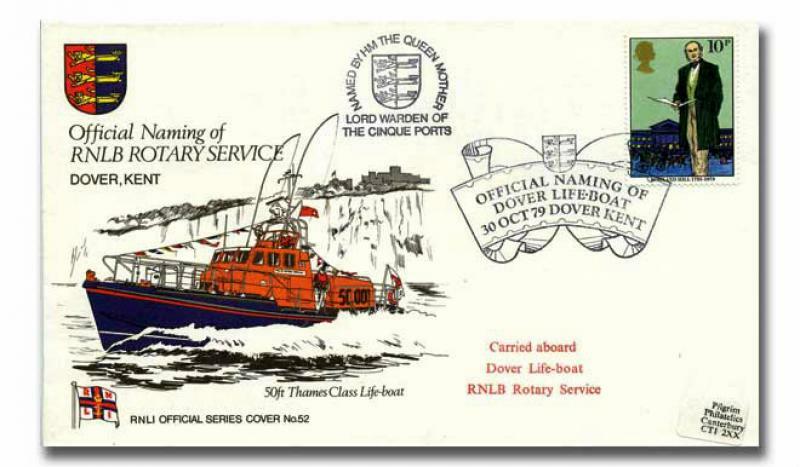 Cover commemorating the Official Naming of RNLB Rotary Service, with a Dover, Kent postmark. 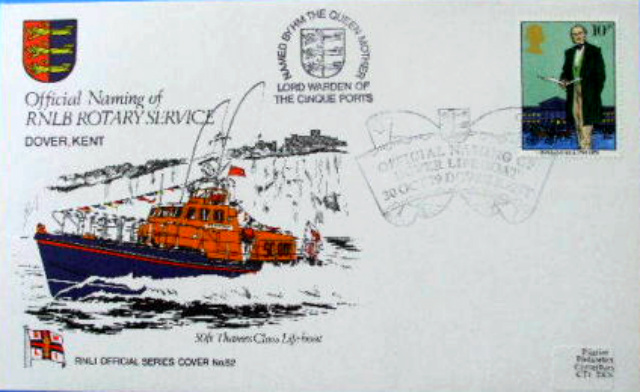 Another commemorative cover illustrating the official naming of the lifeboat by HM The Queen Mother was issued on 30th October 1979 with a 10p stamp bearing a Dover, Kent postmark. 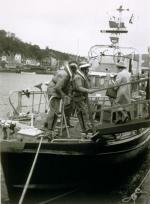 Lifeboat - "ROTARY SERVICE" commenced in Falmouth in 1974.
relocated to Dover in 1978. The RNLI Committee of Management then decided that a slightly larger and faster lifeboat was needed and cancelled the order for the four Thames Class life boats and placed orders for the Arun Class lifeboats. In 1997 "Rotary Service" was replaced by the brand new Severn Class, "City of London II". She was placed in the relief fleet. After a few months in the relief fleet, "Rotary Service" was withdrawn from service. 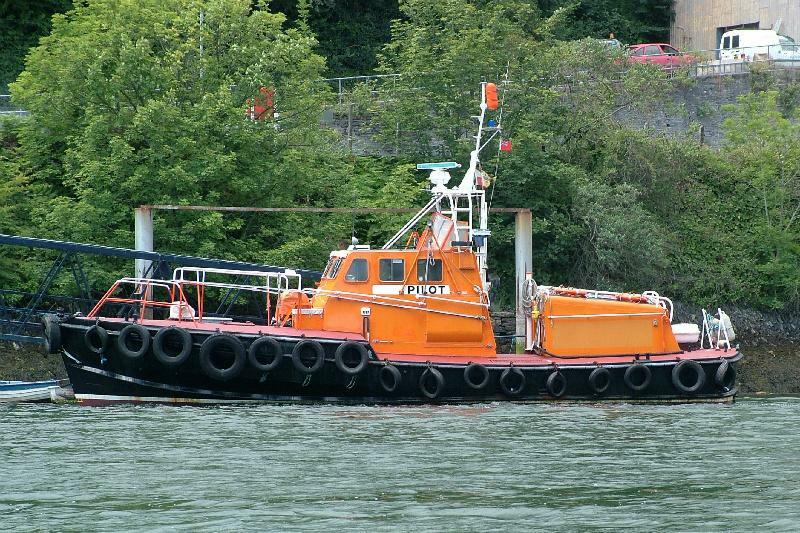 The following year she was sold and was renamed "Treffry" and converted to a pilot boat to serve in Fowey in Cornwall. 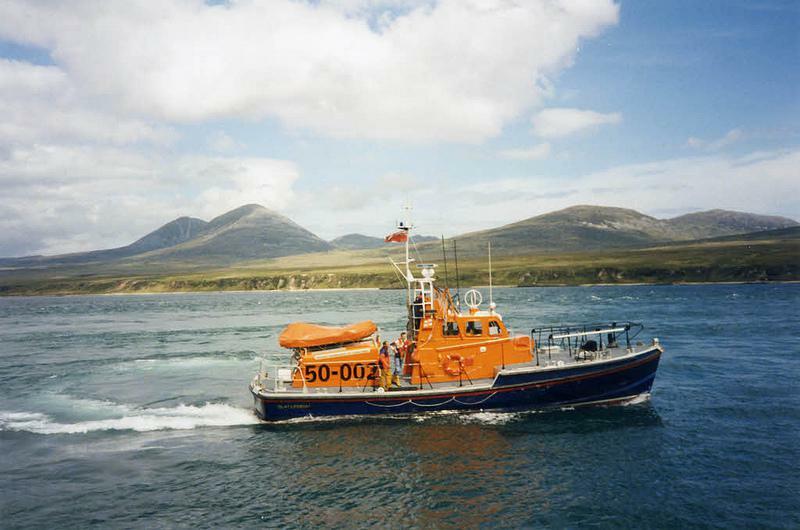 Her last known service was as a pilot boat at Castletownbere in Ireland. Though the financials from the sale of "Rotary Service" was not requested by RCWW, the Rotary movement was pleased that the proceeds from the sale would have assisted with the acqusition of the replacement life boats. 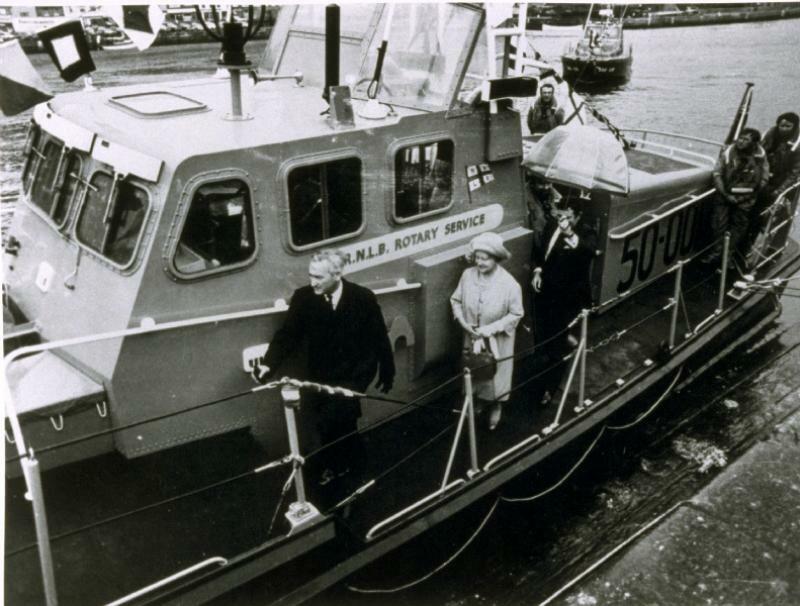 The Rotary Life Boat was always associated with the Gracious Queen Mother who named her "Rotary Service". 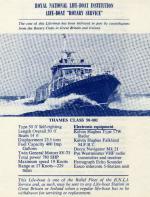 Six Thames Class lifeboats were ordered. Two were completed and launched but four were cancelled and replaced by the Arun class lifeboats. The sister lifeboat to "Rotary Service" was sold to New Zealand in 1997 and renamed "P&O Nedlloyd Rescue". She was stationed at the Sumner Lifeboat Station in Port Lyttelton. In 2010 she was sold to the Lyttelton Port Company (LPC) and replaced by a new locally built Sumner Class lifeboat. 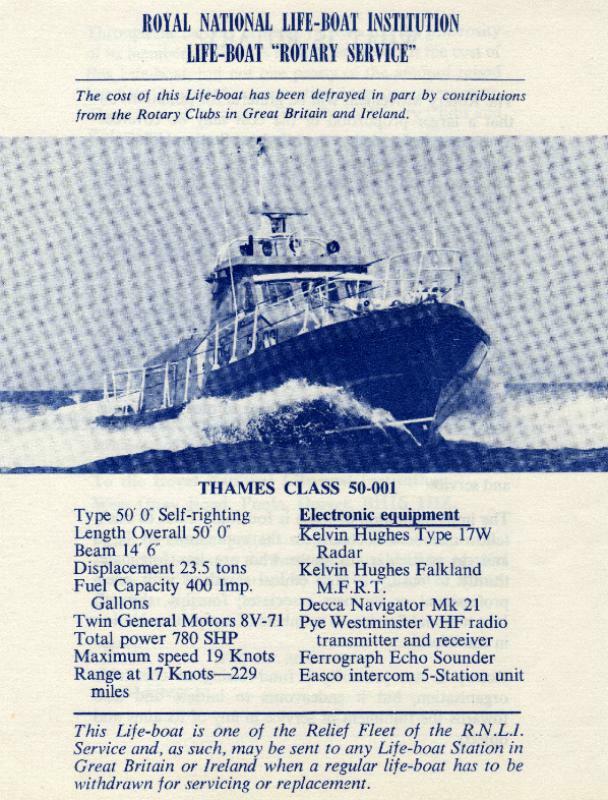 The Thames Class boat then served as a work boat and relief pilot boat named LPC Rescue.